Tim Minchin in Perth to launch Matilda the Musical. SWANBOURNE-raised Tim Minchin describes his career as being incremental, where he only ever had the confidence to take the next step once having evidence he was OK at the last step. The mind boggles as to where this notion will take Minchin following his incredible success writing the music and lyrics for Matilda the Musical. 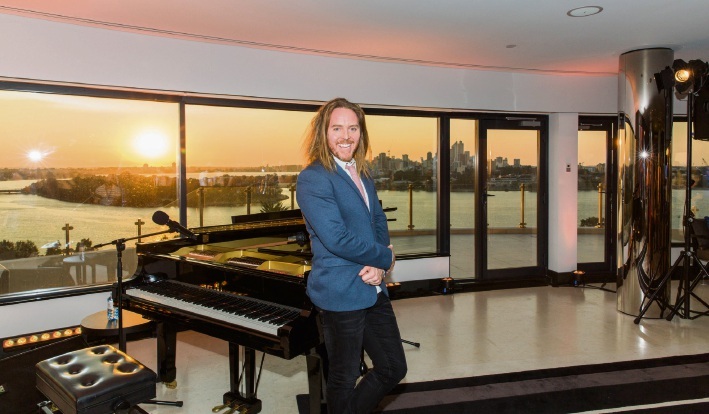 Minchin is in his hometown this week to launch the Perth season of the hit production at Crown Theatre Perth from February 2017, following a seven month season in Sydney and nine month run in Melbourne. The Australian version comes after triumph on the West End and Broadway. “It’s a gorgeous feeling bringing Matilda to Perth,” Minchin said. “We opened in England and New York which both went really well, but you got a sense the audience weren’t on top of all the jokes with the sense of humour and darkness. “I just think Perth is going to love it and I know it will go really well; any excuse to come home for a bit. “I have lots of family and friends who have flown to see this show but there are lots who haven’t or haven’t been able to take their kids to it. Based on Roald Dahl’s popular novel, Matilda the Musical is directed by Matthew Warchus with a book by playwright Dennis Kelly who it is clear Minchin holds in high regard. “Complexity can obscure meaning but working with someone like Dennis, with a text like Dahl’s, it can make it sparkly,” he said. “I’m a puzzle maker and the art of making lyrics feels as much like a science to me as any, not that I’m following a rule at all, but it feels like a sudoku that clicks into place if you spend enough time on it. Minchin, who grew up devouring Dahl’s novels, said he was confident the musical brought goodness to the world. “Given it’s a global thing, it’s nice to think that hundreds of artists are employed, hundreds of thousands of people a year get the experience of it and it’s a story with an incredible intellectual feminist icon,” he said. “I’m not saying it’s the greatest piece of art ever made, but it’s about standing up to bullies and knowledge emancipating you; about knowledge being the way to freedom. “I used to get asked when I first wrote it how it felt appealing to a young crowd because I usually swear so much. “I didn’t find it weird transitioning at all and I don’t think Matilda and my comedy stuff are very different; it’s just there are certain words you use when you’re explaining adult concepts that make you angry and there are certain words you use while trying to evoke a sense of childhood wonder or a child’s anger at a bully.